Whether you want to be the next Street League champ or simply want to cruise the local skate park with style and ease, it all starts with buying your a skateboard and – more importantly – buying the correct set up for you. evo is here to help you through the process. 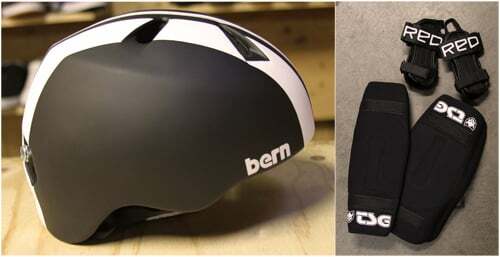 A helmet and pads will go a long way in helping you skate another day in the event of a crash. Caring for your skateboard - Some tips. The skateboard deck refers to the actual board platform you'll be riding. Skateboard decks are traditionally made of multiple plies of laminated maple wood (7 is the average) for durability and strength. When beginning the search for a suitable skateboard deck, the width is an important overall characteristic. Different shapes and widths of decks are conducive to varying styles of skateboarding, but in the beginning choosing a deck width slightly narrower than the length of your foot is the best bet. Skateboard widths (barring longboards, cruisers, or miniature boards) range from 7.7” to 9” or more. The most common deck shape is the symmetrical "popsicle" shape, but directional retro and fun shaped boards that trend wider are increasing in popularity. How do you know what is right for you? There is no right or wrong deck, it's all a matter of personal preference, so trying different sizes and shapes is best. In general, wider boards tend to be more stable while narrower boards are usually more responsive and easier for tricks.Remember everyone, safety first, and second… and probably third. One of the most important parts of your skateboarding set up will be top-notch safety equipment including Helmets, Knee Pads, Elbow Pads, and Wrist Guards. Properly utilizing safety equipment and knowing how to fall correctly ensures a pain-free and prolonged skateboarding career. Wheelbase is the distance between your mounted trucks and varies based on your board's length. A longer board will have a longer wheelbase. Like your “stance” in any other board sport, if you have longer legs, you’ll want a wider wheel base. The wheelbase determines the turning radius of the board; a shorter wheelbase will have a shorter turning radius and a longer wheelbase a bigger turning radius. Concavity is the amount of bending and shaping found between the toe and heel sides of the board and can affect the ease of performing tricks in numerous ways. Every manufacturer has differing degrees of concavity, and two decks from the same brand may even have different concavity. More concave boards usually perform better for technical flip tricks, while flatter boards are generally easier to control. 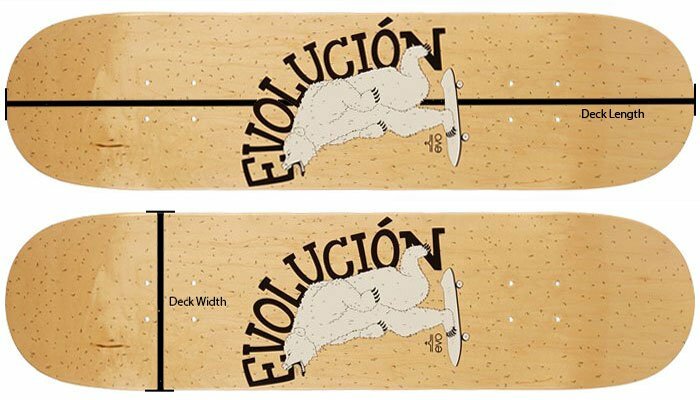 Like width, having a more concave or less concave deck is a matter of personal preference. It takes trying a few different boards to know what you like best! Trucks attach the wheels to the deck and allow for turning and pivoting on the axle. Typically forged out of steel, a skate truck is comprised of a hanger, an axle that runs through the hanger, a baseplate, a kingpin, bushings, along with the nuts and washers that go with it. The ease of pivoting on trucks can be adjusted. Tightening the nut on the kingpin compresses the bushings and creates a stiffer feel when turning. Looser trucks are easier to turn while tighter trucks help you generate more pop. Changing the hardness or durometer of the bushings will also change how the trucks will pivot. Trucks come in different widths so it's important to know the size of your board before picking out trucks. Truck size is determined by the width in inches of the axle (shown in the diagram above). Ideal truck size (axle width) is the width from one edge of your board to the other. The majority of trucks are produced to be suitable for most 7.5” to 9” + deck widths. Trucks are available in varying heights and each is better suited for various skateboarding styles and activities. In general, there are LOW, MID, and HIGH truck styles. Best for skateboarding in the streets or at a park, but very versatile, this truck height is the most common for all-around skateboarding. This height is utilized by skaters mainly interested in cruising or carving and those less focused on flip tricks. Bushings are rubber pads between the kingpin and the hanger on a truck. There are 2 bushings per truck. Harder bushings are stiffer and turn less easily but produce more energy giving a springier return to center or more resistance for pumping. Softer bushings absorb energy and impact making turning easier. The kingpin is the threaded bolt that holds the bushings to the truck hanger. Tightening your trucks, via the kingpin nut, can change the way your board performs. Skateboard wheels vary in diameter, which is measured in millimeters, and their hardness, measured on a scale called durometer. Depending on what kind of skating you enjoy, you should consider these two variables as they will influence the way your skateboard rides. Wheel diameter, measured in millimeters, is usually printed on the outer surface of the wheel. Different sizes of wheels lend themselves to different styles of skateboarding. The most common range for street and park skating is between 50mm and 60mm, while wheels larger than 60mm are usually used on longboards or cruisers. 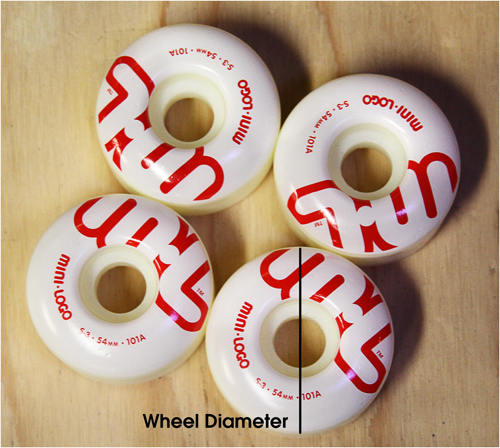 Smaller wheels (50mm to 54mm) are slower and more prone to getting caught on cracks or rocks, but are preferred by street or technical skaters due to less weight and increased ease for technical tricks. Larger wheels allow the skateboarder to go faster and avoid cracks, but increase weight. Beginners should start with a wheel in the middle of the range, ~54-55 mm. Wheels also vary in their hardness. Wheel durometer, or hardness, is generally rated on a scale called “Durometer A Scale” with hardness ratings from 1-100A, 100A being the hardest. Softer Wheels ( <88a to 95a ) are great for skateboarding on rough surfaces, rolling over cracks and pebbles. They aren’t appropriate for technical or street skateboarding, as the grip and softness of the wheel reduces the ability to pop the board off the ground and perform tricks. These wheels are frequently used on decks meant for easy cruising, or by filmers that want a smoother, more stable ride. Harder Wheels ( 95a to 100a ) are most common for street or technical skateboarding. These wheels have less friction and ride faster. Wheels of this durometer are versatile and work well in the most common skating areas such as street, park, or vert. Some wheel hardness is measured in Durometer B; wheels using this scale tend to be a lot harder. Refer to the durometer chart for conversion between Durometer A and Durometer B ratings. Bearings are all manufactured in the same size which makes the process of buying bearings simpler - any bearing will fit any wheel. Bearings fit inside the wheels and allow them to spin with less friction and greater speed. Differences in bearings include the quality of construction and the speed rating of the bearings themselves. Industrial ball bearings are rated on a scale called ABEC (Annular Bearing Engineer's Committee) factor, which establishes dimensions, tolerances, geometry, and noise standards in an attempt to aid industrial bearing manufacturers and users in the production, comparison and selection of bearings for general applications, on a scale of 1,3,5,7, and 9. Beacuse the ABEC system was not intended as a rating system for skateboard bearings, it should not be treated as the only measure of quality for skateboard bearings. 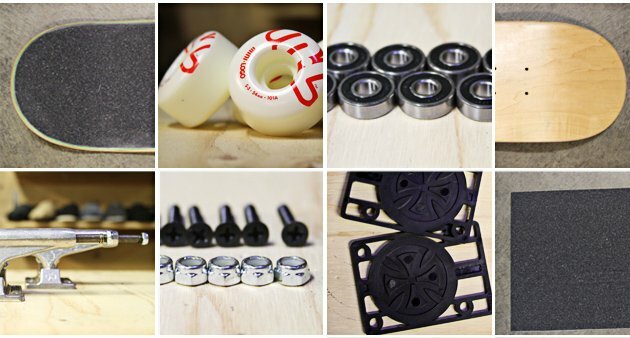 Some bearing brands equate ABEC rating directly to the speed and quality of their bearings, while other brands like Bones have chosen to completely dissasociate their products from ABEC ratings. The bottom line is that higher quality bearings will have sturdier construction, less friction, and a higher ABEC rating if, applicable. Maintenance: Bearing shields keep dirt from getting into the bearing and the ball bearings. Speed cream or lubricant keeps bearings smooth, clean and quiet. 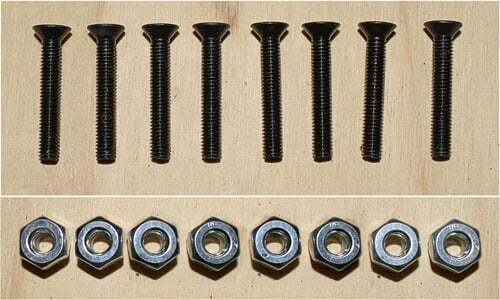 Hardware is necessary to attach the truck assembly to the actual skateboard deck and comes in sets of 8 bolts and 8 nuts. The most common sizes of hardware are 7/8” (for use with no risers) and 1” (for 1/8” risers). These sizes of hardware should be sufficient to assemble most skateboard set-ups. 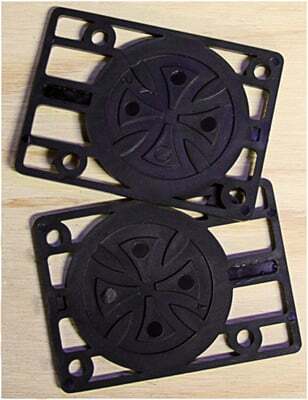 If you're using riser pads with a height larger than 1/8”, then longer hardware sets may be required. Use a 3/8” socket size tool to change hardware. They protect your deck and graphic from impacts and slides. They give you a stable sliding platform that is flatter than the natural curve of a skate deck. They provide you with some grip for tweaks and methods. Grip tape is the adhesive sandpaper-like material applied to the top of the skateboard deck. Grip tape is necessary to ensure control and grip on the board for the skater. Most grip tape manufacturers make a standardized size and personal preference reigns supreme. You can choose whatever manufacturer or style that works best for you! Learn how to grip a skate deck with our video guide here! Riser pads are utilized to protect the skater from dreaded “wheel bite” (a nasty situation caused by your wheels contacting the deck of the skateboard and provoking a crash). Not everyone needs riser pads, and if you are rolling around on wheels less than 54mm or 55mm, you should be fine. But riser pads add additional benefits, such as reduced stress on the skateboard deck by distributing pressure efficiently. Shock pads are slightly slimmer than riser pads and reduce vibrations when you skate. They can be used with or without riser pads. Remember everyone, safety first, and second… and probably third. One of the most important parts of your skateboarding set up will be top-notch safety equipment including Helmets, Knee Pads, Elbow Pads, and Wrist Guards. Properly utilizing safety equipment and knowing how to fall correctly ensures a pain-free and prolonged skateboarding career. Make sure to keep your skateboard in moderate temperatures as much as possible. Leaving your deck in a hot car or in a cold, damp garage can lead to warping or mold. Keep your deck away from water as much as possible as it will rust hardware. Your bearings will also accumulate dirt rapidly, so make sure you clean them regularly and re-apply bearing grease. Keep your grip tape clean with Grip Gum. Use Wax to smooth out and protect your deck when riding uneven or abrasive features.